Strikes by railway and subway workers as well as Hyundai Motor workers are taking a further toll on the nation‘s economy, already suffering from continued low growth in the wake of weak consumption and exports. As the strikes have continued for several days, damage has begun to snowball due to the partial paralysis of car production and logistics networks, industry watchers said Thursday. Financial damages from the strikes by unionized workers of Hyundai Motor, the country’s biggest carmaker, have already hit a record high. A production loss caused by 22 rounds of strikes this year reached 126,000 cars, worth more than 2.78 trillion won ($2.53 billion), according to the company Thursday. This compares with the previous record in 2012, when 12 strikes caused 1.7 trillion won in financial damage. Damages from the strike are expected to soar as the management and the labor union failed again to reach an agreement during the 26th round of negotiation on Thursday. The walkout is expected to continue next week. The Public Service and Transport Workers’ Union also extended their strike for a third day, cramming public transportation, especially freight transport. Even though the operation of the subway and regular trains remained stable, with 89 percent of trains and subways scheduled to operate normally, repercussions for freight transport were particularly bigger, with only 32 percent of freight transport in regular operation, according to the Ministry of Land, Infrastructure and Transport. Freight transport has operated at only 30 percent since the beginning of the strike Tuesday, according to the Transport Ministry, which could potentially cause a logistics crisis. Most of the subway operation in Seoul, however, is expected to return to normal Friday as Seoul Metro and Seoul Metropolitan Rapid Transit Corp. reached an agreement at the last minute Thursday to end the strike by midnight and continue to negotiate on the merit-based system. Unionized workers from Seoul account for 18 percent of the total strikers. In response to the strikes, Labor Minister Lee Ki-kwon vowed Wednesday night to take all measures necessary, including an emergency adjustment order for Hyundai Motor to ban the strike for 30 days. Under existing law, the labor minister can order an emergency adjustment when a labor dispute is related to public services that can endanger the national economy or the daily life of the public. 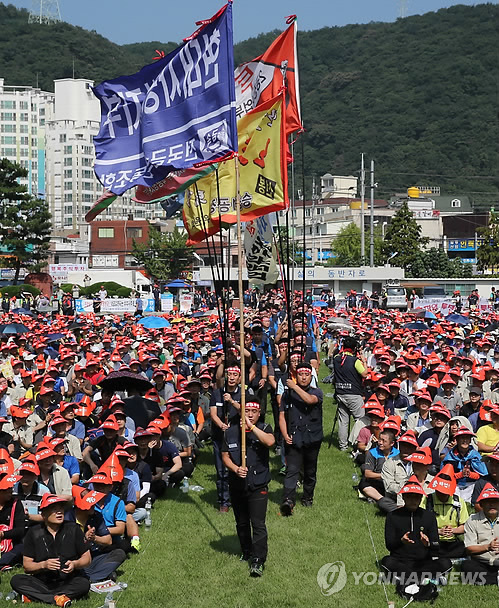 The union leader of Hyundai Motor, Park Yoo-ki, said Thursday that the union would strongly oppose such a measure at any cost. The government also rolled out a set of emergency measures to minimize the impact of labor rest in public transportation, including injecting emergency cargo substitutes and waiving highway fees for substituted trucks, Transport Ministry officials said. Rail and subway workers and financial industry employees launched strikes earlier this week to protest plans to introduce a merit-based system and wage peak system, affecting other sectors, including hospitals. The Korea Health and Medical Workers’ Union held a one-day rally Wednesday. Some hospitals, including Seoul National University Hospital, were still under partial strikes as of Thursday afternoon, delaying waiting hours for patients. Unionized workers in the finance sector said the performance-based system would make dismissals easier and would have a negative impact on society.